SACRAMENTO, CA – Many historians agree that of all the revolutions, none has left so much culture, pride and romanticism like the Mexican Revolution of 1910. Lasting a little over ten years, it featured world renowned Rebels like Francisco I. Madero, Pancho Villa, and Emiliano Zapata, with the latter two having an American-made feature length films about their lives. But, other key component were the songs, attire, and stories of heroism that are still talked about and presented in modern times. Now, for the first time in the Sacramento region, all this can be experienced as Bella Productions, in concert with the Mexican Consulate of Sacramento present REBELS WITH A CAUSE: The Mexican Revolution. 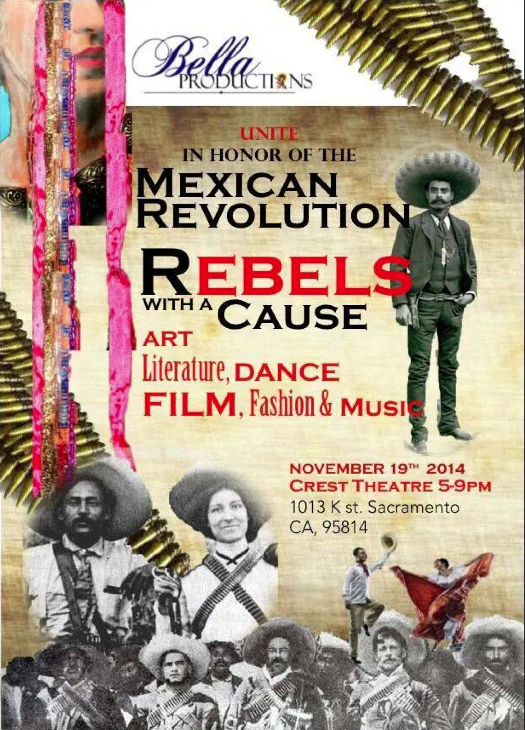 Scheduled for November 19, 2014 at the historic Crest Theater, REBELS WITH A CAUSE: The Mexican Revolution will feature an evening of art, fashion, story telling, dance, and musical performances recognizing Villa, Zapata and the women soldiers who joined them, Las Adelitas. The evening will begin with a welcoming reception at 5 p.m. and will feature local author Samuel S. Ortega who will be on hand to autograph copies of his published book “Viva Villa,” and entertainment provided by Veronica Esparza and Mariachi Tradicional. Performances will begin at 7 p.m. with period dances by the Ballet Folklorico-Rincones de mi Tierra, narrated by dance director Marcos Sanchez, and followed by the all-female Bella Mariachi Trio. Mariachi music became the symbol of the Mexican Revolution because it represented the national spirit of the indigenous Mexican blood. Local designer extraordinaire Rory Castillo, of Castillo Designs, will present the varied fashions of the Revolution that will be eloquently modeled by the gracious Reina and her court from the Sacramento Reina Fiestas Patrias. Other performances include the Folkloric Group Los Alteños local singing sensation Dinorah. “Throughout the program, we will go from fiesta to Corridos, which narrate a variety of events, such as important battles, and celebrated great leaders and fighters of the revolution,” adds Garcia-Robles. Tickets for this extraordinary and culturally educational event are $25 and can be obtained at www.ticketfly.com/purchase/event/710487/tfly. Event coordinators are also encouraging those who can afford it to purchase a block of 10 tickets to donate to local school students. A portion of funds raised will be donated to scholarships offered through the nonprofit organization Cien Amigos. Bella Productions was founded by Lucy Garcia-Robles in 2013 with the goal of creating a production company that gives back to the community. Together with Aida Perez and Anna Padilla they have set out to help nonprofit organizations fundraise through events and activities that promote cultural and historical educational values. One of the most active Consulates representing Mexico, the Sacramento Mexican Consulate offers a variety of services and information to Mexicans living in the region and those who wish to travel to Mexico. Besides community cultural events, the Consulate offers information about educational opportunities and health services.